Rev. Ferriday's music journey started in the late 80's when he formed Loop with Robert Hampson; A critically acclaimed Indie rock band whose debut album "Heavens End" reached No1 in the N.M.E charts. This was swiftly followed by their first John Peel session in 1987. "And very good too" quoted the late DJ. In the early 90's he played in a successful country rock band, Sintra, supporting bands such as The Rocking Birds and Green on Red. In 2001 he joined the newly formed National Debt with Michael Messer on Lap Slide and Owen Bray on Guitar, Mandolin and Harmonica. In 2012 Rev. 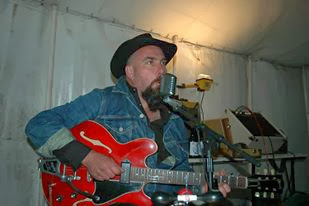 Released his first solo album J.F.D "A foot stompin acoustic album" after recently reviewed by Jak Miller of Lucid Productions Biography "A fun country record with echoes of Seasick Steve, a dash of Johnny Cash and the structure and vocal melodies of Brian Setzer/Stray Cats. Rev. conveys the stories in his lyrics incredibly well and the musicianship from both him and Owen Bray is not only perfect for the music they are playing but is played very naturally throughout" Summer of 2013 Rev. Ferriday has just released his second album "Nine Beats" which conveys much more of a low down dirty feel, "Somewhere between Johnny Cash and Nick Cave and the bad seeds" You can now find the Rev. Ferriday playing with his band "The Longdogs" at various venues. The Rev. Ferriday has his own sound, the songs that he writes and plays are deep in lyrical content with a simply driven slide guitar.